Enjoy freshly-prepared breakfasts and unique views in the comfort of Greencourt's spacious, restful dining room. 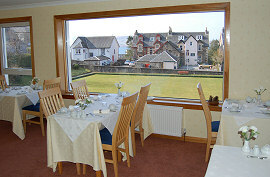 With table arrangements featuring crisp white linen and crystal glassware, guests enjoy a leisurely breakfast as the boats come and go in Oban Bay, and the colours change on the Mull hills. A wide variety of cereals, porridge, fruits, juices, oatcakes and home-made preserves is on offer as well as a choice of freshly-prepared cooked breakfast dishes made, wherever possible, from the finest locally-sourced ingredients. You need to try our popular scrambled eggs with smoked salmon! We make our own jams and marmalades and use locally-sourced produce wherever possible, like our tasty pork sausages from Letterfinlay in Fort William and free-range eggs from Balvicar Farm on Seil Island. We are very happy to accommodate vegetarians and guests with special dietary requirements.